Schists have intermixed quartz, feldspar, and mica (biotite and/or muscovite), and often amphibole. 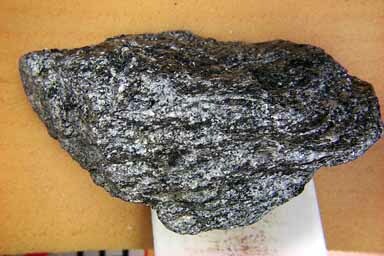 This specimen is dominated by biotite, quartz, and feldspar. Often other minerals are present too, such as garnet and staurolite, but none are present in this particular specimen. Schistose foliation composed of intermixed quartz, feldspar, and biotite (with some possible amphibole). The minerals in this specimen are well intermixed, characteristic of the schistose pattern, although when looking at the enlarged specimen it begins to look more like gneissic banding. It is a matter of scale though; if you have to get this close to see the minerals separating into bands you are still in the schist realm. Schists are hard to photography and capture their details; all the minerals tend to be mashed together. The details are even hard to see when the specimen is in front of you. However, go to a very large picture, and you can see the intermixing of the minerals better. Schists are typically associated with major mountain building events when shales or clay rich sandstones (wackes) are metamorphosed through depth of burial, and proximity to batholiths (click picture for larger version).